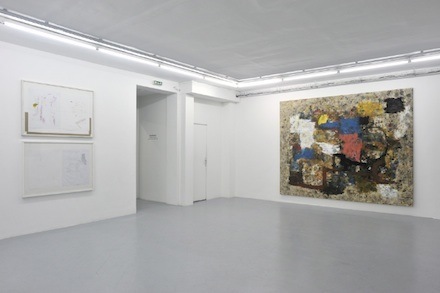 Joe Bradley, Duckling Fantasy (2011) installation view, courtesy Almine Rech. 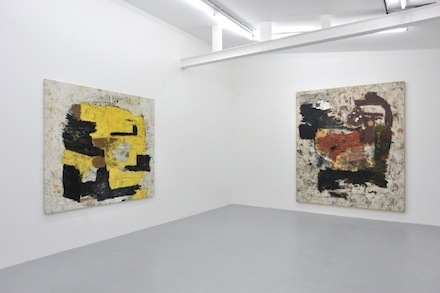 Joe Bradley’s “Duckling Fantasy” is currently on show at Paris’s Almine Rech Gallery. The exhibition consists of new, somewhat large-scale paintings from oil, oil sticks and pencils, that continue Bradley’s interest in color and dirt. Joe Bradley exhibition advert, courtesy of Almine Rech. The paintings are on canvases look visibly abused; as Bradley notes in the exhibition statement, “I’ve really put them through the ringer”. Bradley suggests that the paintings can be read as abstract, but that “the human body is in there somewhere.” Bradley worked on the unstretched canvases while they were on the floor of his studio, creating a dirty, battered background to the canvases, which allows the bold colors of the abstract-like core of the paintings to come forward. This adds to the viewers’ sense that they are looking at something that has been primitively performed on, continuing the artists fascination with drawing (and children’s drawing in particular). Although battered, Bradley’s work can be described as fun. For while the paintings at Almine Rech look used and abused, they also have a sense of abandon, with muted color blotches they remind one of a child’s coloring book. 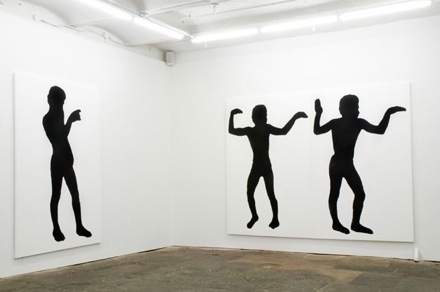 Simple, child-like forms were the topic of Bradley’s recent show “Human Form” at New York’s Canada. Here Bradley used black-and-white silk-screened figures in various break-dancing poses. Bradley was also recently shown at Gavin Brown’s Enterprise. Almine Rech will be showing “Duckling Fantasy” in Paris through July 30, 2011. This entry was posted on Sunday, July 24th, 2011 at 12:04 am	and is filed under Go See. You can follow any responses to this entry through the RSS 2.0 feed. You can leave a response, or trackback from your own site.